Since a recent visit from a Buddhist Chaplin we have occasionally tried a touch of mindfulness to help de-stress a particular moment by trying to be in the moment, so to speak, and you have rather caught us all at it. Not perhaps your average crowd of novice meditators but anyway…“Ommm”. You see it’s all rather my fault – our picnic bench construction has taken off and interest is rapidly increasing. I have perhaps slightly over-promised on the numbers to be completed this week. To top it all, the temperature in Quarry Field late afternoon must be in line with Centre Court… It’s hot, it’s pressured and with deadlines to meet it gets a wee bit stressy! So today after lunch (Tuscan three-bean soup) we just try to relax. Everyone sitting in dappled shade on a much in-demand LandWorks picnic bench. Trying to concentrate on breathing, being in the moment. Not a single “ting”, no suppressed giggles… Just quiet. Well we must have managed a couple of seconds before a series of tremors shook the bench, people collapsed helpless with laughter, this seemed to set off a series of aftershocks. I know, I know, how very childish – but laughter is wonderful. Happy and stress- free, we head back to work, musing on whether monks in Tuscany do or even should consume this delicious but cheeky cocktail of legumes. 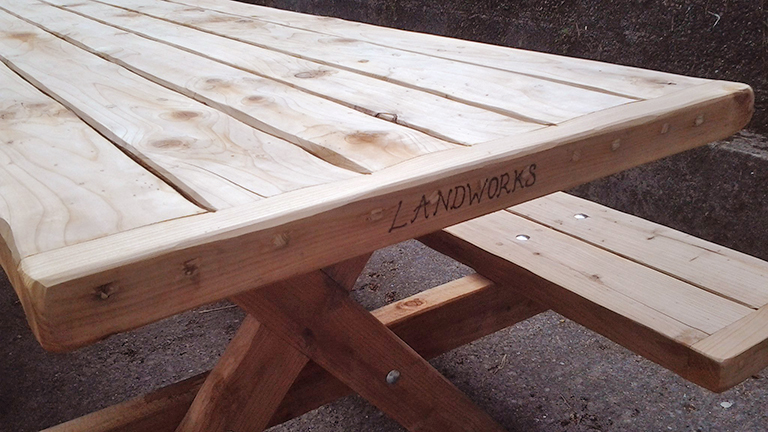 Well we made it – all benches constructed, sanded and signed by LandWorks. Ready for collection. They are made from redwood, cut from Dartington trees in a sustainable managed way that avoids clear felling. Everyone at LandWorks is involved in the process, from design to construction! To become proficient at our art and also to bring in much needed cash (apologies to Buddhists!) we are going to be making more of these beautiful picnic tables that could be yours (for a suggested donation), so please do contact us if you would like one. They are available in two sizes: 5’6” or 8”. A must for patios this year and I am sure years to come. If you are interested or would like to find out more, please do give me a call on 07970 158571.